PORT-AU-PRINCE, Oct 27 2011 (IPS) - Workers in Haiti’s apparel manufacturing sector charge that factory owners are repressing attempts to organise workers in the capital, after the dismissals of six of seven leading members of a new union within just two weeks of its formation. The new union, Sendika Ouvriye Takstil ak Abiman (SOTA), is recognised by the Haitian government and supported by the Haitian union federation Batay Ouvriye, which organised the only other textile workers’ union in the country on the border with the Dominican Republic in 2006. Judeline Pierre, a rail-thin 44-year-old mother who works at the Sonapi Industrial Park near Port-au-Prince’s airport, said she has been secretly attending union meetings organised by Batay Ouvriye for months. Textile factories in Port-au-Prince employ about 29,000 people, in a country of nine million with an estimated unemployment rate of 80 percent, according to the U.S. Embassy. The minimum wage is about five dollars per day, though some workers earn more by exceeding production quotas. Change, or More of the Same? Last year, at a signing ceremony for the agreement to build the industrial park in northern Haiti, U.N. Special Envoy to Haiti and former U.S. president Bill Clinton spoke to IPS. Asked how the development of Haiti's textile industry today would be different from the 1980s, when the industry was at its height, he said the plan has changed. "I think that what happened with Haiti in the 1980s is the same thing that happened, in a way, when the Marines were here from 1915 to 1933," Clinton said. "Haiti was rocking along, nobody ever did anything to change the underlying reality of Haiti, to increase their capacity to govern themselves. "And the same thing happened when they had a manufacturing boom in the 80s - it couldn't be sustained because nothing ever happened inside Haiti. So this time what we're trying to do is build the capacity of Haitians to govern themselves and also get back their natural resource space, their ability to grow their own food, their ability to grow trees again, to restore the land and their whole self-governance. "It's a very different thing now. This is a piece of a much broader strategy," he said, before leaving the room. A handful of contractors run the factories, assembling and exporting duty-free garments for U.S. companies like Hanes and The Gap under the terms of a preferential U.S.-Haiti trade deal known as the HOPE programme. Two Haitian factory owners, Charles Baker, whose factory fired one of the union-connected workers, and George Sassine, the head of the owners’ industry association and executive director of the HOPE programme, told IPS they were not opposed to unions in principle and that recent worker firings are justified. Sassine said he believes Batay Ouvriye aims to completely shut down factories, rather than merely organise workers. Stepping out of his air-conditioned office onto a buzzing, 1,640- worker-strong factory floor, Baker gestured around, “If they want to unionise, they can unionise. But they need to do it in the right way.” He said he fired a man handing out flyers during work hours and interrupting production. Between the workers and the factory owners is Better Work Haiti, a nine-person team funded by the U.S. Department of Labour charged with monitoring labour conditions in Haiti’s textile factories. The group will issue a fact-finding report on the alleged firings of SOTA members next month. Better Work Haiti’s third biannual report on compliance with International Labour Organisation standards was released two weeks ago. It found violations of some occupational health and safety and minimum wage regulations in over 80 percent of the factories, but in the four “core” labour standards, compliance rates are near perfect. Richard Lavallée, Better Work Haiti’s director, said the factory owners “are fully engaged in the programme” and praised the steady improvements in compliance with core standards over the last two years. The fourth core standard is the right to freedom of association and collective bargaining. The latest report identifies just two instances of non-compliance, including a 12-day-long strike in May which resulted in the firings of 140 workers. But the low non-compliance rate is potentially misleading. “Although no non-compliance findings are cited in the current report under Union Operations,” the report notes, there are “very significant challenges related to the rights of workers to freely form, join and participate in independent trade unions”. “If you look at the reports, in Haiti there is only one unionised factory (in Ouanaminthe) out of 23 operating factories. In the factories in Port-au-Prince, there are no unions. We don’t have any evidence,” Lavallée said. He explained that if a factory owner fires a person for trying to organise workers, it won’t be noted in the employee records reviewed by his team. 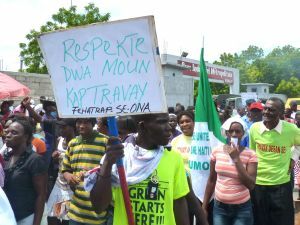 Haitian union activists have continually complained of attempts to stifle union activity by factory owners, Lavallée said, but he hadn’t seen evidence and the activists had not provided names of dismissed workers until last month’s round of firings. The expansion of the textile industry in Haiti has long been enshrined as a key plank of the country’s reconstruction and development plan. A U.S. Embassy spokesperson told IPS the industry has the potential to more than double in the next four years. Officials say 20,000 jobs will be created by Korean garment manufacturing giant Sae-A, which inked a deal with the Haitian government last year to build an industrial park in northern Haiti. The project’s funding by international donors, including 50 million dollars from the Inter-American Development Bank (IDB) and 120 million dollars from the United States, was “not conditional on allowing unions to organise that space”, according to Canadian political scientist Yasmine Shamsie, who has studied Haiti’s textile industry. “I’m very disappointed in the industry’s reaction to the new union,” Shamsie told IPS by email, referring to SOTA. Her 2010 report for the Conflict Prevention and Peace Forum called for a “high-road approach” to the Haitian apparel industry’s expansion, including unionising workers and providing welfare programmes to raise their living standards. A study published last March by the AFL-CIO’s Solidarity Center found wages needed to be nine times higher for apparel industry workers to pay for basic living expenses. Senator Steven Benoit, who spearhead the last minimum wage increase in Haiti’s parliament, said wages need to raised again. Sassine, the industry association president, told IPS a higher minimum wage would force factories to lay off workers and close down. Secret diplomatic cables made public by WikiLeaks show that Sassine and the U.S. Embassy worked together to oppose Benoit’s last attempt to raise the wages. Having worked there for two years, Judeline Pierre plans to quit her factory job and return to selling goods in street markets next year. Her family is worried about her health and she said she hasn’t earned enough to pay for her two children to attend school this year. In the late 1980s, Claudy Fevois, like Pierre, worked for three years at an apparel manufacturing factory near the Port-au-Prince airport. At the time, the industry employed about150,000 people, before the sector was devastated by political instability. *Ansel Herz is a freelance reporter who blogs at http://mediahacker.org.